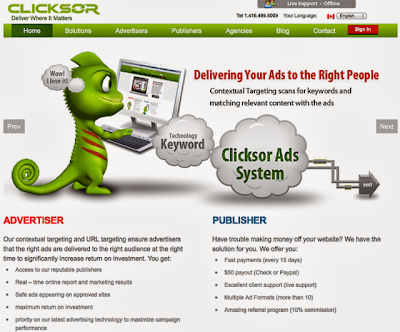 Clicksor is an online contextual advertising network based in North York, Ontario. The network is launched by its mother company Yesup Ecommerce Solutions Inc. Publisher free to selects advertisements most relevant to publishers’ content and places the ads accordingly. This is commonly known as contextual advertising. The first Ad - Serving Company scans a publisher’s page to find keywords that describe the content. Next, they will match these with advertiser-provided keywords so only advertisements related to the page content will be displayed. Publishers offers a total of 9 various targeting methods, and pays their advertisers on a CPC/PPC, CPV/PPV, CPM and/or CPI basis. Clicksor.com was registered by on 27 Jan 2004. The website is 9 years old and located on the IP 199.21.148.21 . According to our analysis, it is visited by 389,000 visitors daily . It holds an alexa rank of 229 and has a pagerank of 4. The website is in English and its its content might not be safe for family (could be adult). No malware was detected on the website. Advertisements submitted to Clicksor’s network are first reviewed by a Verification Team for compliance with the Terms of Service. Advertisements will be rejected if they fail to meet these standards or contain illegal content. Pop-Unders are different from usual ad version of pop-up. You can say that Pop-Unders are more user friendly version of usual ad version of pop-up. They appear in a new window which is minimized. Viewers or visitors would not be disturbed and can finish whatever they are doing at that moment, they will notice the pop-under after they close their current browser. You can see Clicksor Pop-Under sample below. Also known as full-page ad units. When visitor clicking on an link to your website, the full-page ad unit appear for them before visitor proceeding to your website, forcing them to see the advertisement for some period of time. By entering a specific word or phrase into the search box the users will see results, sponsor links that brings them to the information that they are looking for. DOES CLICKSOR AD NETWORK ACCEPT ADULT WEBSITES AND BLOGS? Yes, Clicksor does accept adult content website/blogs to join there advertising network. Only if they’re going to meet Clicksor requirements which are: 5,000 page views per day and at least 50% of website/blog traffic have to comes from Canada, UK or US. However, without a doubt, websites and blogs with illegal content will not be accepted. For more details read here. HOW TO ADD CLICKSOR BANNERS, POP-UNDER ADS, IN-TEXT ADS TO YOUR WEBSITE?One option is very simple, by using Clicksor own plugins widgets like: WordPress, Blogger, Joomla and Drupal. HOW MANY CLICKSOR AD UNITS CAN YOU PLACE PER PAGE? You can place up to 3 Clicksor ad units or 2 Search boxes on a page, without violating Clicksor terms of service. WHAT IS CLICKSOR ADVERTISING RATES AND REVENUE? CAN YOU FILTER CLICKSOR ADS THAT ARE DISPLAYED ON YOUR WEBSITE? Yes if there are any ads that you don’t want to showing up on your website, just contact your Clicksor account manager and tell them the ad and the destination of the ad. CAN YOU USE GOOGLE ADSENSE AND CLICKSOR TOGETHER ON SAME PAGE? Clicksor Advertiser and Publisher Details.